This is the third in a five-part series contrasting the ways our society could handle end-of-life care moving forward. We’ve heard these words and many more like them. Far too many in our medical system seek the easy way out rather than adequately responding to patients’ needs as human beings. Make no mistake, there are mountains to climb when it comes to health challenges. Some mountains are just too tall to climb, but many are not, and some want to give up before even starting. It can be tough being a doctor or a nurse. Often you see people at their worst, and eventually many of your patients die. You often see caregivers at their worst, too, struggling to take care of a terminally-ill child, or a parent with dementia, or many other tragic conditions. It can be tempting to embrace despair. Some in our medical system sadly internalize that despair, and it infects their role as healers. Some even let it control their professional judgement, giving patients and their family unrealistically bleak prognoses or even trying to pressure or coerce patients and caregivers into giving up. Perhaps they believe they are doing those patients a favor. Despair is badly failing patients, however. 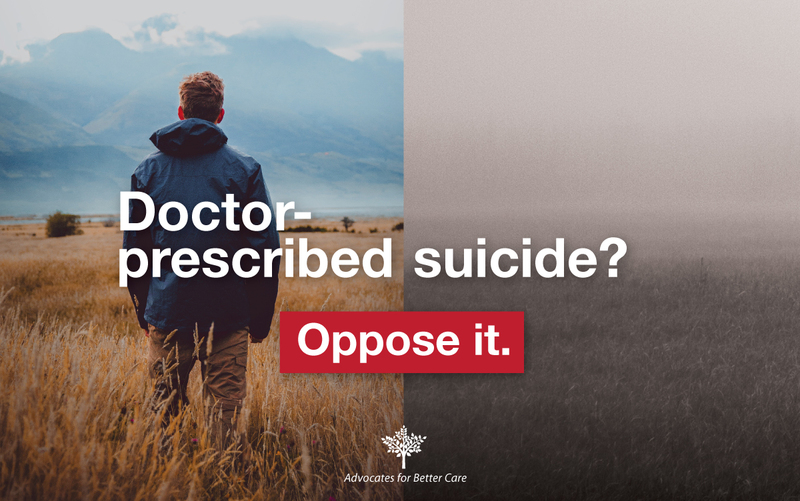 Countries and states that legalize doctor-prescribed suicide run roughshod over concerns about how it really affects patients. Instead of despair, patients should be offered realistic views centered on hope and life. Sometimes diagnoses are wrong, including terminal diagnoses. When patients express hope to overcome their disease, they should be given accurate information, including about risks of treatments, and then their decision should be respected, whether it’s deciding they no longer want to receive medical care they believe is burdensome, or they want to try to continue their fight. They should not be overridden in secret or bombarded with offers of lethal doses of drugs. Some patients know they are going to die, but have not prepared themselves for it, or have some unfinished business, or simply enjoy life and want to have a few more months of it. They shouldn’t be told their quality of life makes those last few moments less important or unworthy of care than others. Other patients succumb to despair. This isn't merely deciding the time is right for their terminal condition to take its course, but truly the same despair that afflicts others in the prime of life and leads them to attempt suicide. We should not look at one person and say, “you have so much to live for!”, and at the other person and say, “do it!” That mode of thought degrades the value of life and will quickly metastasize to other issues. Often caregivers can become exasperated. The persons they care for may be unable to express their own wishes. Sometimes medical decisions fall on them, with no clear instructions from their loved ones. 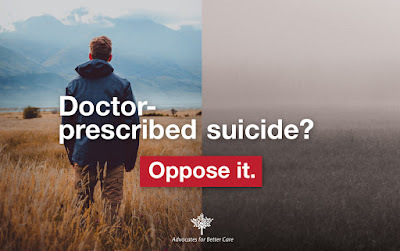 They should be given advice in line with the best interest of the patient, not offered euthanasia as a solution to their own struggles, or even having their loved one passively euthanized in secret—supposedly to spare them grief. Despair is often short-lived. When patients and caregivers get the care and support they deserve, they are often able to continue on with dignity—for however long life allows or it. Robert Salamanca was one such person. Suffering from ALS (Lou Gehrig’s disease), Bob wanted to die. In fact, he wanted to travel to Michigan to die here; at the time Jack Kevorkian was working to end the lives of as many people as possible here. But suicide is not what Bob really wanted; he was facing the dark pit of despair. Thankfully, Bob had family and friends in place to pull him back from the brink. Bob was able to spend the end of his life with his family, learning new skills, and indulging his great love of boxing as a quadriplegic (watching on cable, of course). He passed away peacefully in his sleep. Others are not as blessed as Bob with such a great support system. Before his death, Bob wrote an article in the San Francisco Chronicle about how advocacy for euthanasia and doctor-prescribed suicide fed his despair rather than offering him hope. If physician-assisted suicide is legally available, the right to die may become a duty to die. The hopelessly ill may be subtly pressured to get their dying over with — not only by cost-counting providers but by family members concerned about burdensome bills, impatient for an inheritance, exhausted by care-giving or just anxious to spare a loved one further suffering. Too often our hospitals and our society see challenges and pressure people into just giving up. Instead of despair, we must offer people a realistic view focused on hope and life.